In Scandinavia and many parts of mainland Europe building a kit home is a very common practice. 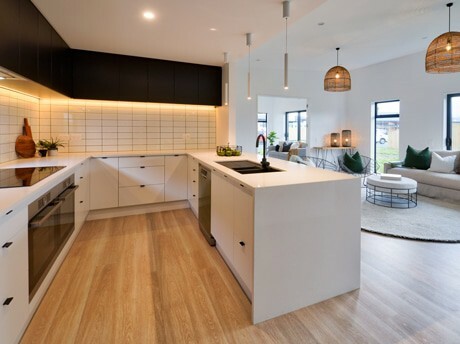 Kit set homes in New Zealand are on the rise, as more people are becoming aware that building a kitset home offers a number of advantages, like a shorter build time and reduced labour costs. Fraemohs Homes has been manufacturing and supplying Danish-style kitset homes from locally-grown New Zealand timber for over 50 years. We offer two types of kit homes – Solid Timber and Timbermode. Solid Timber homes are what many people traditionally associate with Fraemohs. 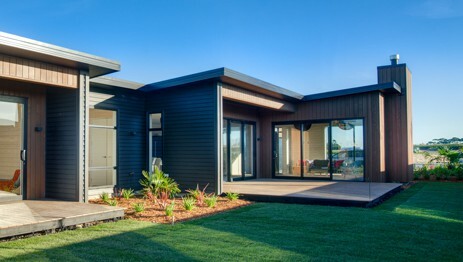 The Timbermode range are designed specifically for those wanting designer kitset homes in New Zealand. With conventional kitset homes you generally can’t modify the design at all. But because we manufacture all of our kitsets locally in our own factory just outside Christchurch, we can create custom kit homes to suit your specifications. We regularly design and manufacture custom kit homes for a wide range of uses. From architecturally designed chalets for hotels and motels, to luxurious four bedroom homes through to cosy secondary dwellings or baches. A popular use for our solid timber kitsets is as chalets for hotels and motels. 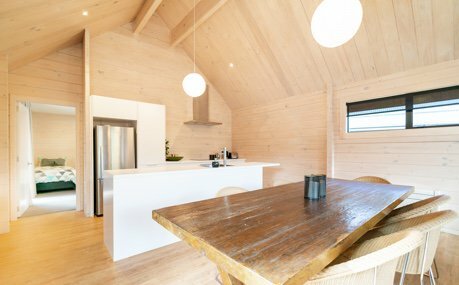 Among our Solid Timber house designs are several predesigned 1 and 2 bedroom designs like the Karamea, which can be customised for purpose. But if there are specific requirements, we can design a chalet from scratch too. Our standard kitset homes prices cover the design of the home above the foundation. But we can also help make your build even more hassle-free by assisting with foundation design, and managing the building consent process on your behalf. If a home uses timber as its primary material, it’s really important the timber is grown locally from sustainable forests. 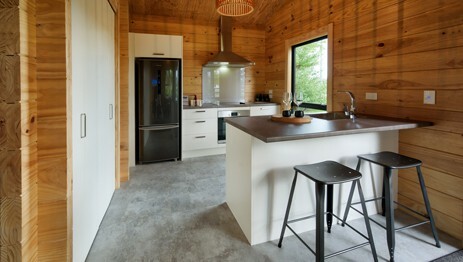 If the timber is grown overseas, the carbon miles used on transporting the timber here for kitset eco homes in New Zealand far outweigh any supposed eco-friendly benefits. Even if the imported timber has been sustainably grown. Using local, sustainably grown New Zealand timber is exactly what Fraemohs Homes have been doing since we were founded 50 years ago. It is in fact one of the very principles Monni Fraemohs ensured the company would be guided by and we proudly adhere to this. With kitset eco homes by Fraemohs, what you will find is your home is naturally warmer in winter, and naturally cooler in summer. This is because the timber we use provides a tremendous amount of natural thermal mass. And this thermal mass reduces your reliance on electricity for heating and cooling, as well as other means of energy generation like log burners. Combined with various other Scandinavian design techniques we continue to utilise in our kitset designs, our Solid Timber kit homes are actually carbon negative by the time they are ready to live in. For more information on our approach to building sustainably, visit our Eco Homes page. You might also be interested in downloading our free 2018 Sustainable Building Report. We have been busy producing these and began rolling them out in August, 2017. Designed to answer any questions you might have on building your new kit house while you are on the go. The video series covers all areas of the build. View the kitset instructional videos here. Our Solid Timber kitset homes are log cabin-style kitsets with solid timber walls. You can build these yourself if you are reasonably handy and able to lift heavy pieces of timber. 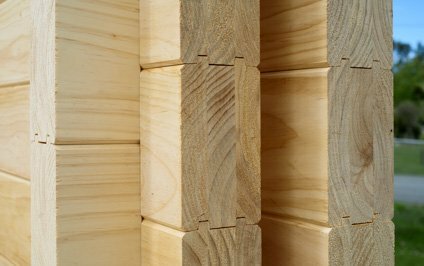 The walls of our Solid Timber kit homes are constructed of planks of laminated kiln-dried pine which interlock. This means they work in a similar way to that other famous Danish product, Lego! You don’t need any nails for the walls, just a sledgehammer to fit the pieces together. Each piece is numbered numerically and each wall is marked alphabetically. Laminated exposed roof beams fit neatly into pre-machined slots in the walls. The sloping ceilings in the living areas are made from grooved ply. If you are not a builder we generally recommend that you get a specialist in to tackle the foundation and roof construction. You will need a registered plumber and electrician to do the plumbing and electrical work in accordance with New Zealand legislation. We also supply architectural kit homes which are kitset versions of our Timbermode range. These designer kitset homes are more complex to build and require a qualified builder or someone with building experience. Two distinctive styles - Timbermode or Solid Timber. Which do you prefer?